What are the differences, and which is right for you? Open Cell Foam Insulation is a type of foam where the tiny cells are not completely closed. Open cell is usually less expensive because it uses less chemicals. It is a very good air barrier but does not provide any type of water vapor barrier. It is much more sponge like in appearance. It is often used for interior walls because it provides an optimum sound barrier. It is not recommended for outdoor applications. It expands about 150 times its original volume to form a semi-rigid, non-structural plastic. This foam typically has an R-value of approximately 3.5 per 25.4mm (1 in.). R-value measures resistance to heat flow—the higher the R-value, the greater the insulating power. Closed Cell Foam Insulation is a much more dense type of foam than open cell. It has a smaller, more compact cell structure. It is a very good air barrier as well as a water vapor barrier. It is often used in roofing projects or other outdoor applications, but can be used anywhere in the home. The material is used in interior applications, spray-applied to a substrate, before expanding about 35 to 50 times its original volume, and forming a rigid plastic with a compressive strength between 103.4 kPa and 172.4 kPa (15 psi and 25 psi). This foam has an (aged) R-value of around 6 per 25.4 mm (1 in.). 2-lb SPF can be applied in multiple lifts to achieve various thicknesses for desired R-value and air barrier performance. Despite the shared qualities between 1/2-lb and 2-lb spray foams, it is each foams type of unique propertiesthat ultimately assist in selecting the proper material for the project. 1/2-lb foam is normally spray-applied to the desired thickness with one pass, while 2-lb foam is spray applied at lifts from 12.7-mm to 38-mm (0.5-in. to 1.5-in.) until the desired total thickness is achieved. Excess foam can be trimmed easily with saws or knives, however, most applications do not require full stud thickness, meaning trimming is usually, unnecessary. For example, foam installed at 51-mm (2-in.) thickness between 2×4 studs requires a minimal cleaning on the stud face. However, foam installed to full stud thickness requires additional trimming with trimming tools. Both 1/2-lb and 2-lb foams have air barrier qualities that can help reduce noise from outside the building envelope (i.e. airplanes and car traffic). The 1/2-lb foam’s density offers additional sound absorbing qualities, however, neither foam is exceptionally effective at reducing vibrational impact noises. Moisture has two primary means for entry into/through the building envelope—water vapor diffusion and air leakage. As mentioned above, the excellent air barrier qualities of both 1/2-lb and 2-lb foam helps effectively preclude the latter, however, the foam types differ when it comes to vapor diffusion. The higher the material’s permeance, the faster water vapor can pass through. Controlling water vapor within a building is important for preventing condensation, mold growth, and subsequent damage to building components. 1. The ‘flow-through design,’ which allows water vapor to pass through the building assembly’s components without condensing. 2. The vapor retarder design, which limits the moisture entering the building assembly altogether. 2-lb foam typically has a permeance of less than 1 perm at 76-mm (3-in. ), and can be used in flow-through designs without a vapor retarder. Exceptions include situations where there is a constant vapor drive in one direction (i.e. natatoriums and cold storage facilities), or when there is a vapor retarding material on the assembly’s cool side. 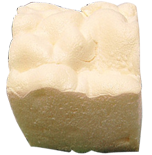 1/2-lb foam has a high open-cell content (greater than 50 percent) and liquid water can enter the foam. 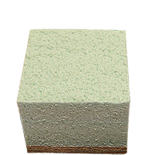 Conversely, 2-lb foam has a high closed-cell content (greater than 90 percent) and resists water absorption. In a building assembly, the latter foam offers added weather or rain barrier protection. 2-lb Closed Cell Foam has the highest R-value as compared to all other available types insulation products.